The aim of this project is to enhance the capacity of community conservancies within the Ewaso ecosystem in monitoring and surveillance of wildlife, particularly elephants and their threats. Phase 1: participatory mapping of patrol blocks & locations with scouts; identify monitoring objectives & key species; training in data collection methods. Phase 2: Review of monitoring system progress, modification of patrol blocks & wildlife species where necessary; training of managers & heads of security in paper-based monthly summaries. Phase 3: Introduction of computerised data storage, training scouts in computer skills; purchase of laptop computer & solar power system for conservancy headquarters. Phase 4: Development of monitoring database tailored to each conservancy; training of manager, head of security & scouts in basic database use. Phase 5: Further review & modification of database; training in advanced database operation, maintenance, reports & maps. During this reporting period CoMMS was introduced to or expanded in Mpus Kutuk, Lekurruki and Biliqo-Bulesa conservancies. 18 scouts in Lekurruki were trained in Phase 1 of CoMMS in February 2009; 11 scouts in Biliqo-Bulesa conservancy were trained in some elements of CoMMS in June 2009 (with a focus on elephant mortality monitoring). Heads of Security and Radio Operators in Mpus Kutuk and Il Ngwesi conservancies were trained in preparation of monthly summary reports. In 9 of the 12 target conservancies, summaries of the monitoring data are now produced on a monthly basis to provide feedback to scouts and conservancy managers in order to improve patrol coverage and intensity and highlight specific threats or areas for increased patrol intensity. These summaries are also provided to the Kenya Wildlife Service District Wardens. 10 conservancy scouts and 1 NRT Research assistant underwent computer training in May 2009. This included scouts from Lekurruki (2), Il Ngwesi (2), Melako (1), Mpus Kutuk (1), Namunyak (1), Kalama (1), Ishaqbini (1) and Meibae (1). These scouts (including 2 female radio-operators) completed a 3-week course on computer skills. Seven conservancies now have the capacity for computerised data entry at a site level. Laptop computers were purchased for Meibae and Mpus Kutuk conservancies and two more computers will be purchased in the second half of this year for Lekurruki and Melako (one with IEF funding). one pair of binoculars): Sera (1); Il Ngwesi (3); Lekurruki (3); Biliqo-Bulesa (1); Mpus Kutuk (2); Meibae (2); Namunyak (1); NRT Research & Monitoring team (2); Joint NRT Conservancy anti-poaching team (4); Kalama and Naibunga – to be allocated. 24 pairs of binoculars were recently purchased (8 with funding from IEF, and matching funds from Panthera and Lewa UK). These will be allocated to the following conservancies in August 2009: Lekurruki, Naibunga, Namunyak, Biliqo-Bulesa and the Joint NRT Conservancy anti-poaching team. NRT has been strongly engaged in providing information on elephant mortality for the Samburu-Laikipia MIKE site. In collaboration with Save the Elephants and KWS, NRT provides all records of elephant mortality gathered through CoMMS. A great deal of emphasis has been placed on ensuring conservancies are collecting accurate and standardized data for MIKE, including GPS locations for all carcasses, and streamlining reporting of information to KWS. Elephant carcasses were reported in 9 out of the 11 conservancies where CoMMS has been established (In Naibunga, elephant carcass records were collected by KWS directly as CoMMS has not yet been established here). of 2008. The increased number of carcasses can be attributed to both increased emphasis and better reporting of carcasses from conservancies, an increase in poaching/illegal killing in February 2009 and high mortality between April-June that is likely associated with the ongoing drought. 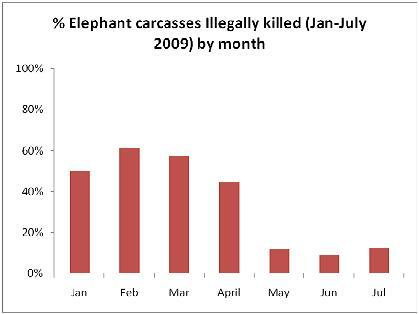 The proportion of illegally killed elephants (PIKE: elephants dying as a result of poaching or conflict and predominantly through use of firearms) was 36% of all carcasses reported between January – July 2009. However, it should be noted that for the first three months of this year the proportion of illegally killed elephants was more than 50%, and was highest in February (61%). This compares with the PIKE figure for carcasses reported by NRT conservancies in 2008 which was 60% as a result of the increase in poaching experienced between July-December 2008. During March and April this year, as a result of the high number of poaching incidents reported in Namunyak in particular, a joint KWS & Conservancy operation was held to recover ivory and arrest suspected poachers. This operation successfully reduced the poaching threat within the conservancies which is reflected by the low PIKE figures for May-July this year, however poaching remains a persistent threat in northern Kenya. 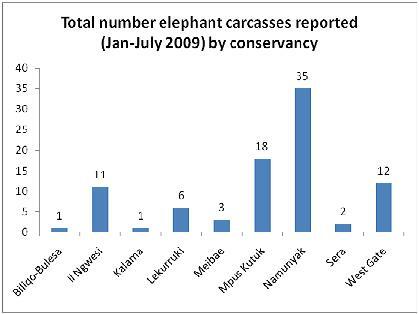 The graphs below show that both the highest number of illegally killed elephants were reported in Namunyak (16) of which 12 were found with tusks missing. While the proportion of illegally killed elephants was highest for Biliqo-Bulesa conservancy only one carcass was found in this area so far in 2009. PIKE figures for Meibae, Il Ngwesi and Namunyak were also high (above 40%). Only 13 out of 89 carcasses had tusks missing (15% of all carcasses), however, of these 12 were in Namunyak again reflecting the increased level of poaching in this conservancy earlier this year. These results are an indication of the different threats to elephants in each conservancy, as well as the capacity of the conservancy to effectively patrol all areas. For instance Namunyak now covers almost 4,000 km2 within and surrounding the Mathew’s Ranges and Forest Reserve, which is prime elephant habitat, with currently only 40 scouts, i.e. 1 scout per 100 km2, whereas Il Ngwesi, Lekurruki, Kalama, Sera and West Gate have an effective force of between 1 scout per 6-20km2). Notably the highest PIKE figures were for the conservancies where the effective scout force is lowest i.e. only 1 scout per 40-100 sq. km. of the on-going drought). The majority of these have been in Mpus Kutuk, Namunyak and West Gate Conservancies and more than 50% of these carcasses were either juveniles or sub-adults.